This large, classic series consists of the adventures of Saeba Ryo, a sweeper or hired gun and his partner Kaori. Throughout the 140 episodes that make up the 4 seasons there are mainly 1-3 episode stories that intertwine very nicely. Also 3 movies that came out during the series' release and 3 specials that aired later. This anime is considered Action/Comedy but it has a lot of the entertainment value that you get from a Super Power type anime due to Ryo's implausible skill. Saeba Ryo is not only an absolutely perfect marksman but by nature will hit on every beautiful woman he sees, which is the origin of many of his jobs. Kaori, Ryo's female partner in business will often straighten him out with something heavy, like a 10 ton hammer to the head. He tries to keep a rule of only accepting female clients so this is often necessary. At whim he will go from a super marksman to hitting on any woman that comes within view. He uses a .357 magnum to get himself out of all the trouble these jobs lead him and his friends into. His skill with the gun is to the point of(but not limited to) shooting through the exact same hole in a target 12 times, in a duel with another professional drawing and reloading faster than they can even draw and shooting out 4 wheels on a car that's driving behind him all through the same hole in the rear windshield while only looking through the mirror. His marksmanship is quite literally super human. The combination of action and comedy is perfect and very addicting. Throughout the anime he takes endless numbers of jobs, all original and without getting redundant. From catching a killer that uses hypnosis to make their target commit suicide to stopping a hacker from accessing missile silos. There are a lot of rocket launchers, grenades, plastic explosives and nitroglycerin in this anime =). There are quite a few side characters, around 7-8. All of which are very well done and significant. The animation is very good for its time(1987-1991) in my opinion. The animation doesn't make this anime as much as the story, action and comedy, but the animation is good all the same. As for music, is is overall very good, especially the opening, endings and theme song. I especially like the 1st opening and S2 2nd ending songs among others. The background music and sound effects are also very good. I can say for sure that this anime does not degrade as you get to higher episodes, it only gets better, which is somewhat uncommon for a 100+ ep series. The Movies and OVAs don't lower in quality compared to the series itself either. They fit perfectly with the series at the points that you are supposed to watch them at and it just makes it that much better. Altogether this anime is a must watch, one of the best Shounen animes and very addictive. If you like this anime I suggest watching Angel Heart, as it is a semi-continuation of many of the City Hunter characters. This masterpiece is truly one of a kind. I have no clue as to why this gem of the late 80's is barely known. This anime follows the adventures of Japan's premier hired gun, Ryo Saeba. I gave the story a 9 as there is really no overarching story, or various story arcs. Instead, this series is rather episodic, with many single story episodes with a few 1-3 mini arcs spread throughout. This, however, can also be seen as a forte to this series, as this series isnt hindered by fillers, drawn out fights, repetition, or slower parts like some other series of similar lengths are. Each episode is interesting, especially the mini arcs which usually tend to be deeper in nature. Basically, almost all the episodes follow the basic formula of a beautiful female client who calls upon the help of the highly skilled Ryo Saeba. Do not worry if this sounds repetitive, as each episode definitely holds its own. A great overall story is usually a big must for me in judging an anime, but City Hunter easily gets away with this with its engrossing episodes and strong character interactions (especially if you consider day-to-day living, slice-of-life, etc) and various developments. Basically, this aint no Death Note in terms of plot, but there is a tale of being to be told. I give the art in this anime a 10. First of all, I am judging the art based on the time period it was made. Still, even compared to modern drawing techniques, this anime would get a 9. The art in this anime is fantastic, even by todays standards. The backgrounds are highly detailed and truly give a correct feel for the atmosphere of the settings. The drawings of Shinjuku really come to life as a bustling metropolitan area. Details are not spared in any way. Drawings of the characters are also top-notch. There is a perfect mix of realism and cartoonism. The characters are realistically drawn, with the exception of some disproportion during the comedic moments. The soundtrack of City Hunter is a serious plus for this series. The opening and closing songs perfectly capture the late 80's feel of the series. The background musics are also fantastic and are reminiscent of an 80's/early 90's Hollywood cop movie. Fitting songs pretty much play at all the right times during the series. City Hunter makes up for a lack of overall story with incredible characters. This is especially evident in none other than the main character, Ryo Saeba. Ryo Saeba is typically seen as lazy, easy-going, jovial, and perverted man despite his reputation as one of the most skilled sweepers in the world. However, underneath this appearance is an extremely complex character with an intriguing past. Furthermore, he also has a very strong sense of justice and has a strong sense of what is right and wrong. He is pretty much what many of more recent series' main characters are based on (ex - Spike from Cowboy Bebop, Onizuka from GTO, etc). Besides Saeba is a host of other characters. There is his partner, Makimori, who is also a very complex character. There are also re-occurring characters whose relationships with Ryo become uncovered during the course of the series. Basically, this series has very likable, three-dimensional cast that will make sure that you keep on watching. The enjoyment factor for this series is immense. High quality action, loads of comedy, and engrossing characters pretty much define this series. Although City Hunter might seem like a serious, action oriented series at first, the comedy in this series is plentiful and is amongst the best i have seen in an anime. This timeless classic excels in pretty much everything and is definitely unique amongst the 1000s of animes out there. I am very glad that I didnt miss this great series about one of the greatest characters in anime. "I’m neither an ally of yours nor a tool of those police inspectors who think they are men of justice. I live as I think is right." Ryo Saeba, to a mafia leader. This masterpiece is the adaption of City Hunter's manga, one of Weekly Shōnen Jump's best-selling series of all time, from the all-known popular hit by Hojo Tsukasa. City Hunter is the code name of the main character, Ryo Saeba, Tokyo's best sweeper, private detective and body guard, as well as the number one pervert in Japan. No one can wield the .357 Colt Python Magnum the way Ryo Saeba does. He can shoot while moving with pinpoint accuracy, shoot through the same hole in a target many times, and draw, shoot then reload his gun faster than any opponent. Strongly feared in the underworld of Tokyo, he lives the way he sees fit, in a Carpe Diem way, and can be contacted by leaving a note with an "XYZ "on the bulletin board at Shinjuku Station. Just as how he is an intelligent and ressourceful in the battlefield, Ryo can easily turn into a pervert when beautiful women are around. As for that matter, he accepts requests from women only, resulting in many comical "Mokkori" situations. Kaori Makimura is his self-proclaimed assistant, the sister of his late best friend and partner, and the only woman he doesn't seem to notice. Their gradually evolving teamwork, and their mysterious relationship make their missions all the more intriguing, with many unexpected turns of event. The supportive characters are quite appealing, with the beautiful and skilled Saeko Nogami, the ambitious police inspector who uses her charms to persuade Ryo to help her solve many cases, and Falcon/Umibozu, a good partner in many missions, and an equally good rival of Ryo. As the story unfolds, many old acquaintances make their appearence, and the hidden past of Ryo Saeba comes to light, dark and disturbing. Many hardships await the City Hunter team, and in times of crisis, Ryo and Kaori end up realizing their feelings for each other, but have yet to make decisions considering their line of work. Through the four seasons of 140 episodes of City Hunter, the animation is vivid and pleasant, the voice actors cast brilliant, and the original soundtrack soulful and inspiring. The mind blowing action, the endearing comedy and the bittersweet romance make this anime a classic in the shounen genre, and certainly holds a special place in many hearts. As for the ending, you'll need to read to manga. I highly recommand this anime. A 10 out of 10. It had been a long time since I did not watch any "new" anime , I was just with DBSuper, and began to watch the whole series of Power Ranger. Finally, last month decided to look for something new to watch. I remembered some anime that caught my attention in a magazine that used to buy when I was younger, the "Ultra Jovem". So I went on the website Super Anime and searched for anime according to the year, more precisely 80 and 90, because honestly, the anime today has me filled eyes, even DBSuper, Sailor Moon Crystal (What even stopped watching), only Digimon Tri renewed my teen spirit with nostalgia. So in the middle of the search I found City Hunter. 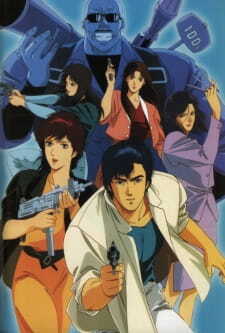 City Hunter has all I love: police investigation, action and humor! The story revolves around Ryo Saeba a sweeper (a kind of private detective), it is a very demanding detective because just take the case of beautiful woman! All this because he is a Mokkori. This word is present all the time in the episodes, say it is a "nickname" for pervert. Ryo and his friend Hideyuki Makimura, unite to form the City Hunter team in Tokyo. And to contact him, just leave a note with the symbol "XYZ" on the bulletin board at Shinjuku station. However, one day, Hideyuki, is murdered by a gang, and Ryo takes care of Hideyuki sister, Kaori, who becomes his new assistant. Kaori spends all his time chasing Ryo to prevent their "acts Mokkori" with their clients, and for this she enlists the help of a hammer of 100 tonnes, which is all the time at the ready just waiting for the slip Ryo. However this persecution Kaori seems actually involve her feelings for him. Sometimes Ryo also has the Umibozu help, another sweeper and longtime friends. Ryo also outsources their work to the detective Metropolitan Police Saeko Nogami, hoping one day he will get paid in "Mokkori", so he keeps a long list of favors already granted to it. City Hunter is one of those anime that has much to teach us, behind the all the humor, there is always a life history lesson, or people overcoming their fears and having their lives changed due to the Ryo, which shows you the right way to act on each situation. In each episode we have a different story, with different people, and different lives. Of people who need not only Ryo help protect them, but also to overcome obstacles and challenges in your life or even see the world differently. Besides the drama, City Hunter has a very exciting soundtrack. I just loved the first openings and ending, can't stop listening. Then you search for an anime with lots of action and humor, and with good story, I advise them to watch City Hunter and will not regret it. Do you have an older game console sitting in the cupboard, basement or attic? Perhaps it's time to dust it off, plug it in and start enjoying it once again. We're about to discover some fascinating retro games based on anime franchises we've grown to love over the years.